WAYANG one of the nation's top arts and culture of Indonesia's most prominent among the many works of other cultures. Culture puppets include acting, singing, music, speech arts, literary arts, painting, sculpture, and art is also symbolic. Culture of puppets, which continues to grow over time, also a lighting media, propaganda, education, entertainment, philosophical understanding, and entertainment. According to the research of historians of culture, culture is a culture of wayang native to Indonesia, particularly in Java. The existence of puppets was many centuries before the Hindus go to the island of Java. Although a popular puppet story in today's society is an adaptation of the works of Indian literature, the Ramayana and the Mahabharata. Both the main story in the WAYANG undergone many changes and additions to adapt them to the original philosophy of Indonesia. Adjustment of the concept of this philosophy is also about the philosophical position of the Javanese people against the gods in the puppet. The gods in the puppet is no longer something that is free from wrong, but like any other God's creatures, sometimes acting wrong, and could be a blunder. The presence of puppet characters dalam_ panakawan deliberately created the culture of Indonesia (Javanese cultural exact) to reinforce the concept of philosophy that in this world there is no creature that is really good, and that is really bad. Each creature is always bearing the elements of good and evil. In his dissertation titled Bijdrage tot de Kennis van het Javaansche Tooneel (1897), the Dutch cultural historian Dr. GA.J. Hazeau indicated his belief that the puppet is the original performance of Java. Understanding puppet in the dissertation Dr. Hazeau it is walulang inukir (a carved leather) and seen his shadow on the screen. Thus, the puppet in question certainly is a shadow play as we know it today. Regarding the origins of this puppet, in the world there are two opinions. First, the notion that puppets originated and was first born on the island of Java, precisely in East Java. This opinion is in addition to adopted and raised by researchers and experts in the nation of Indonesia, also wasresult of research of Western scholars . Among Western scholars belonging to this group, is Hazeau, Brandes, Kats, Rentse, and Kruyt. The reason they are quite strong. Among other things, that the art of puppet is still very closely related to sociocultural and religious state of the Indonesian people, especially the Javanese. Panakawan, the most important figures in a WAYANG,namely Semar ,Gareng ,Petruk ,Bagong ,there are only puppets in Indonesia ,and not in other countries . In addition, names and technical terms puppet shows, it all comes from the Javanese (Kuna), and no other language. Meanwhile, a second opinion suspected puppets from India, which brought together with the Hindu religion to Indonesia. They include Pischel, Hidding, Krom, Poensen, Goslings, and Rassers. Most of this second group is the British scholar, the European country which had colonized India. However, since the 1950's, puppet books as if he had agreed that the puppets are coming from Java Island, and in no way be imported from other countries. Culture puppet was born in Indonesia is estimated at least during the reign of King Airlangga, king Kahuripan (976 -1012), when the kingdom in East Java that was prosperous, prosperity. Literary works the subject of puppet stories have been written by the poets of Indonesia, since the X century Among other things, the script-language literature Kakawin Book of Old Javanese Ramayana written during the reign of King Dyah Balitung (989-910), which is a spin-off from the Book of the Ramayana written by Indian poet, Valmiki. Furthermore, the Javanese poet no longer just translating the Ramayana and the Mahabharata into Old Javanese language, but compose and retelling by entering into this philosophy of Java. For example, the professor's work Kanwa Arjunawiwaha Kakawin, which is composed of berinduk on the Book of Mahabharata. Composed by other, more obvious difference between the original story derigan Indian version, is Baratayuda Kakawin work professor and professor Sedah Panuluh. This great work done in the reign of King Jayabaya, king of Kediri (1130-1160). Puppet as a performance and spectacle had already started there since the reign of King Airlangga. Some inscriptions are made ​​in those days, among others already mentioned the words "mawayang 'and` aringgit' which means that the puppet show. About the birth culture of puppets, Ir. Sri Mulyono in his book The symbolism and mysticism in the Puppet (1979), estimate the puppet has existed since the time of neolithikum, ie about 1,500 years before Christ. His opinion was based on the writings Robert von Heine-Geldern Ph. D, Prehistoric Research in the Netherlands Indies (1945) and Prof. writing. K.A.H. Hidding in Indonesian Encyclopedia page 987. 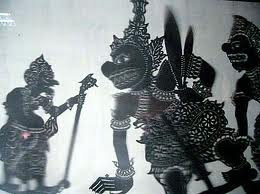 The word `puppet 'probably derived from the word` wayang', which means shadow. This conjecture is consistent with the fact the Wayang Kulit performances are using a screen, a piece of cloth, as a barrier between the puppeteer who plays the puppet, and the audience behind the curtain. Viewers only saw movement through the shadow-puppet motion that falls on screen. At that time puppet performances accompanied only by a simple set of gamelan consist of saron, Todung (a type of flute), and kemanak. Other types of gamelan and singer at that time was allegedly not yet exist. For more menjawakan puppet culture, since the early days of the Majapahit Kingdom introduced another puppet story that does not berinduk on the Book of the Ramayana and Mahabharata. Since then ceritacerita Panji, the story of the ancestors of the kings of Majapahit, was introduced as one form of another puppet. Panji stories are then more widely used for Wayang Beber performances. Tradition menjawakan puppet story also forwarded by some Islamic clerics, among them by the Wali Sanga. They began wayang story of the kings of Majapahit, among them the story Damarwulan. The entry of Islam into Indonesia since the 15th century also gave a big influence on the culture of puppets, especially on the concept of philosophy of religion that puppet. At the beginning of the 15th century, namely the time of the Kingdom of Demak, began to use specially-shaped oil lamp called blencong on Wayang Kulit performance.